To process a lower risk "card holder present" credit card and debit card chip&pin transactions, a business owner uses a PDQ machine. These transactions seem to take upward of 15 seconds in small retail businesses, whilst supermarket transactions seem to happen much faster. 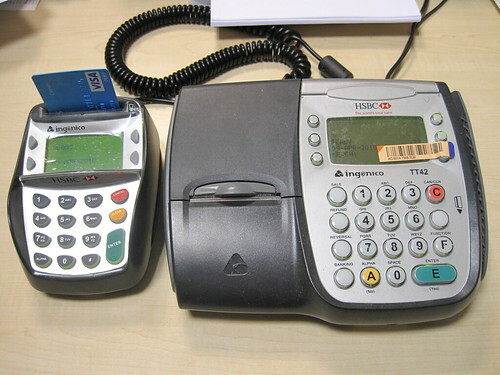 Small business PDQ machines offered by Barclays, HSBC and the like seem to a dial-up telephone to make a transaction. Dial-up is slow. Why should small business have an existing line disrupted by chip&pin transactions, or have to pay extra to get a new line put in? Why doesn't the PDQ machine simply communicate over the internet? Ultimately why should the small business be penalised in time and money in making increasingly popular cashless payments? An initial investigation with Barclays business resulted in an unfriendly conversation with a consultant who at first conceded supermarket transactions are faster, then "refused to comment" about different technologies. Does anyone know the reason why small businesses seem to be getting screwed here?